Great Prices on Waverly Bedding! Waverly Bedding products have been sought out for generations. Since 1923 the Waverly look has been synonymous with stylish American décor. Waverly designs are timeless and feature floral patterns combined with a coordinating stripe to create a style that's classic and appealing to both men and women. Never "faddish" or trendy, Waverly's decorative bedding sets are always in style and complementary. Decorate with confidence with any of these elegant and well-made bedding fashions. 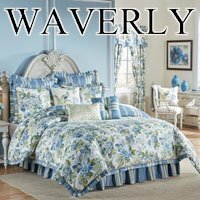 Click below for information on Waverly comforter sets, quilt sets, daybed sets, and coordinating throw pillows, Euro shams, valances, and lined drapery panels. Let P.C. Fallon Co. turn your bedroom into a sanctuary with a Waverly comforter sets, quilt sets, and perfectly coordinated accessories including throw pillows, Euro shams, and window treatments. Waverly has quality products at a great price. Searching for a daybed set? They can be hard to find, but Waverly offers many stylish Daybed Sets! Read our decorating tips.